My phone rang. Some people get booty calls; I get foody calls. It was my daughter’s teaching assistant, quizzing me about what menu items would be suitable for my girl to have with her classmates at an end of term pub lunch. (We had custard creams and squash at the school disco if we were lucky. This lot get a meal out - it’s not fair, I tell you, not fair). It’s the kind of phone call I wish people didn’t have to make, and yet I love that they do. In an ideal world, my girl would be able to take part in food-centred activities without the need for forward planning. 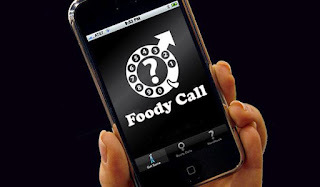 But it’s a Prader-Willi World we live in, and foody calls are needed, and appreciated. “The pub is doing a barbecue for us: we can get some low-fat meat if you like, and something she can have for dessert - you tell us,” the T.A. said. I rattled off my girl’s barbie faves (Weight Watchers’ Cumberland Sausages, Asda spicy bean burgers, and ‘light’ (lower fat) ice cream. “No problem,” was the reply. Two words. Loaded with so much meaning. It wasn’t a problem. Because the school is on board with the importance of thinking ahead, and communicating with me about the potential meltdown minefield of food. They were going to sort, and even shop, to make sure my girl was included. “They can all have the light ice cream and be the same,” the T.A. told me, warming the already toasty cockles of my heart, which got another blast of heat when I picked up my girl from school a few hours later. You did. You had advance team help, but yeah, you really did. Fascinating thing to the babies' left not pictured. Today, I was amused by the sight of several grown men grappling with an unruly erection. This is not as rude as it sounds: they were trying to put up a gazebo at the Manchester PWS Picnic. Despite a terrible weather forecast, the rain above Heaton Park held off for another grand old meeting of babies, toddlers, and teenagers with Prader-Willi Syndrome. My girl was looking forward to seeing her PWSBFF who was also making the long trip oop north. Only we had word that her pal’s journey had started a little late, and was being jammed by traffic. So it came to pass that I had a bizarre discussion with my Prader-Willi teen - yes, the one who is obsessed by food and eating on time - where I was essentially telling her off for not wanting to eat her dinner until her friend got there. Friendships renewed. Post roll, obviously. Once I realised the absurdity of this, I had a word with myself. After all, someone with PWS who never physically feels full up is hardly in danger of ‘ruining their appetite’ for their tea. However, by the time 40 minutes had passed, I realised I did need to try some sneaky tactics to get my daughter to eat (you have no idea how weird that sentence sounds), because I knew there was a cast-iron chance that if her PWS buddy was stuck in traffic she would have already eaten her picnic in the car. My daughter didn’t let me finish my sentence. She didn’t look up at her friend again. Sod “Hello!”. Sod finding out whether her pal had eaten or not. First things first - she’d postponed part of her dinner, out of commendable stubbornness and solidarity, until a particular target time, and the time of RIGHT NOW had been reached. The Season has started. Forget débutantes coming out and flirting with chinless wonders at polo matches, races at Royal Ascot, and fancy balls. Nope, this is the PWS social season, and it’s more down to earth. Over the next five weeks, we’re popping along to three events being organised in various parts of the country by parents, friends, and volunteers linked with the Prader-Willi Syndrome Association UK. 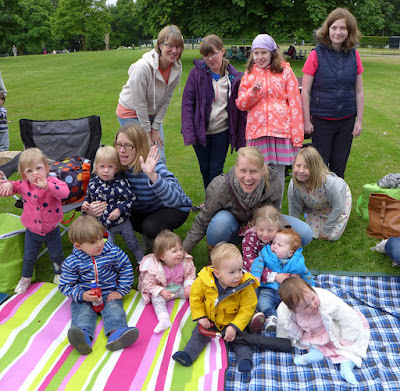 The first of this series of family get-togethers took place today in a London park.The Drake contingent was smaller than at first planned after I left my son at home due to him waking up in a thunderously foul mood (‘overtired’ after partying too hard yesterday). His dad, who this sentence could equally apply to, was also left behind and thus forced to deal with the ramifications of my executive decision that the day would be more peaceful and enjoyable if the girls legged it for the train on their own. I’m told he did stop crying, eventually. My son, that is. 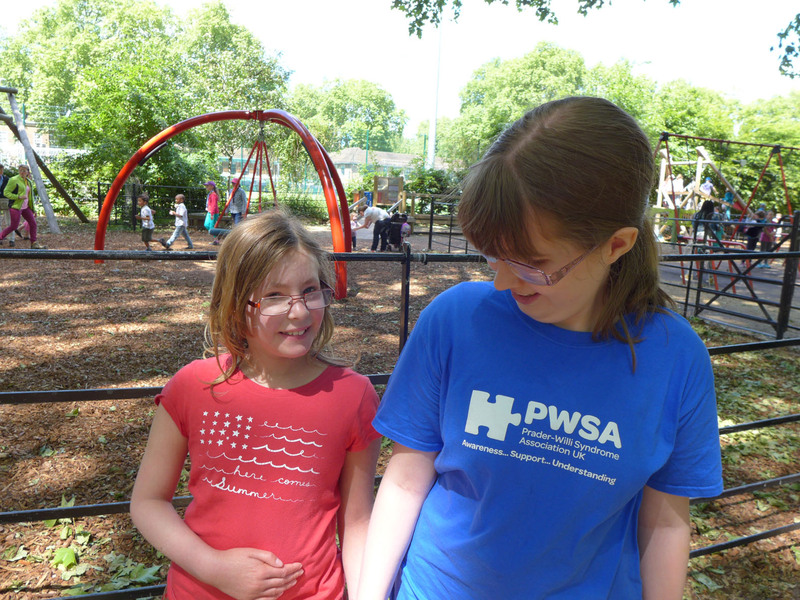 We spotted a couple of blue PWSA UK T-shirts, my girl beaming because she was sporting one too. Introductions and re-introductions were made; my girl remembered names that I’d forgotten from last year. 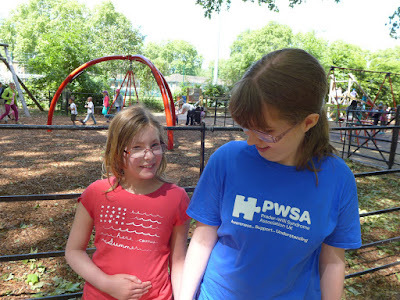 Then it was chatting time, as my daughter rambled on amiably, with the “people with PWS just like me”, including a sweet, nine-year-old girl who gave as good as she got in the Talking The Hind Legs Off A Donkey Stakes. And within just a minute or so of meeting a new face - a 12-year-old boy - my girl was sprawled on a rug with him playing Deadly 60 Top Trumps, to his mum’s amazement. “He wouldn’t normally do that!” she exclaimed. 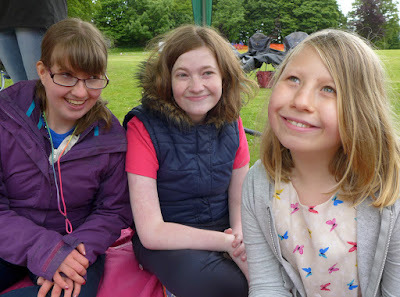 “They definitely wouldn’t normally do that!” we both blurted out, when they were told it was picnic time and both said they wanted to finish the game first. (Although, to be more true to form, they had an almost instantaneous backtrack when they realised the import of what they’d just said and changed their story to: “Yeah, you’ve got the most, you’re the winner, where’s the food?”). But it’s something I’ve seen many times, and yet is always just as special and astounding - PWS kids buddying up, easy with eachother, on eachother’s wavelength, belonging. Things that don’t happen so easily in ‘real’ life with ‘civilians’. 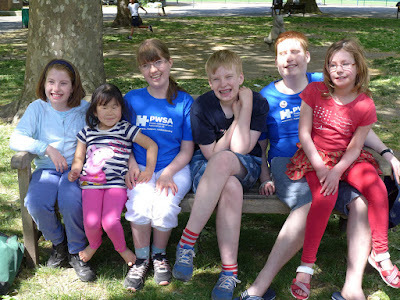 The Prader-Willi Army is an amazing unit. Video is Danger Mouse & Daniele Luppi (feat. Norah Jones) - Season's Trees. It was probably the expression on her face just before she tucked into the octopus. 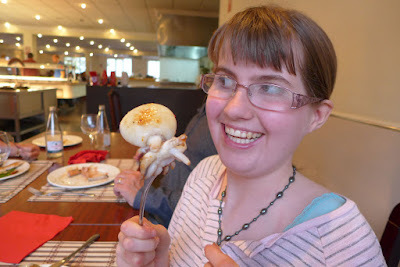 Or the smile she gave as she took a bite of her frog’s legs. No, wait, it was the gasp of delight as the waiter carried out the paella. Or it might just have been the sigh of satisfaction as I handed her the good old-fashioned tuna sandwich I’d packed for the plane journey. My daughter’s holiday highlights always consist of food; it’s the Prader-Willi way. And to tell you the truth, more than a few of my holiday highlights are enjoying her joy at what’s on her plate. 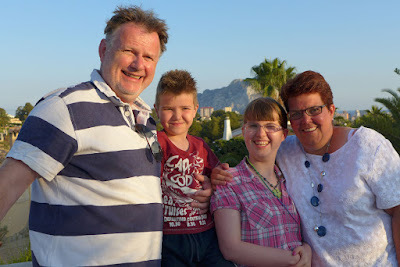 We’ve just got back from a week in Spain. And we had it easy. 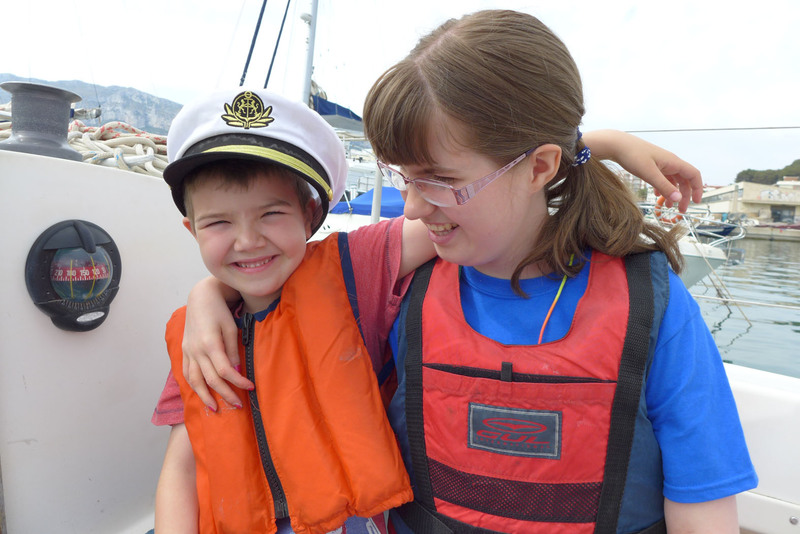 Although it was our first holiday abroad for a few years, we had an advance team who had recced the heck out of our destination. The crack FSAS (Food Special Air Service) was made up of my brother-in-law and his wife, who have a part share in a villa in Calpe. Not only were they able to take out a boxful of healthy snacks and my daughter's extremely special hot chocolate for us in their advance car (they drove, we flew), but they knew most of the restaurants and menus - putting us In The Know, too. So it was that we ate in the Bar Aleman on barbecue night, where there was a huge selection of lovely healthy salads, all available to serve yourself instantly. (There was also an insanely happy German fella in his 70s with a trumpet and a Bontempi organ singing "Digging Ze Dancing Queen!" and a light show that made it appear that people were being targeted with red dots by nearby snipers, but that's another story). So it was that we were able to pack up healthy picnics, and spend a couple of evenings making our own tasty dinners. And so it was that my girl was able to pick her own seafood selection, watch the Taiwanese chef expertly heat it up on his sizzling hot plate, and eat exactly the right portion at exactly the right time. I’m skating over the sailing day lunch, which involved us sitting for 15 minutes in front of a café that we didn’t realise wasn’t serving, but there are always blips. And funnily enough, it was my six-year-old non-PWS Horrible Henry son who was carried kicking and screaming from the square for misbehaving, whilst my PWS daughter ignored her hunger in favour of putting in an increasingly smug Perfect Peter performance. 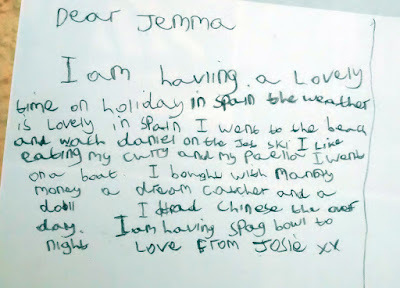 "I am haviing a lovely time on holiday in spain the weather is lovely in SPain I went to the beach and watch daniel on the Jet Ski I like eating my curry and my paella I went on a boat. I bought with Nanny money a dream catcher and a doll. I Had Chinese the over day. I am having spag bowl to night." It didn’t list every meal; just lots of them. Why wouldn’t her cousin want to know what she’d had to eat? 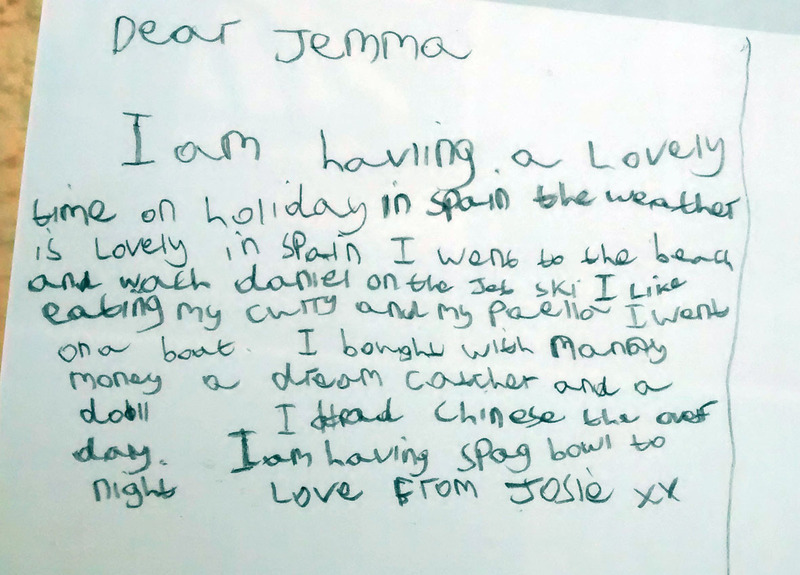 Spaghetti bolognaise of course, will hereafter be known as a ‘spag bowl’ in our house. There is, however, another expression that we have adopted, although it’s not one for the children’s ears. It came out of the innocent-looking mouth of a tiny Russian boy, aged about five, who approached my son on a nearly deserted beach and was babbling away to him in a thick, deep Russian accent straight out of Crimson Tide. His mum was on her way over, but out of earshot. Luckily, my daughter was having mini-siesta under the parasol on the beach, so her super-powered hearing was switched off. Even more luckily, my boy was confused by the accent and had kind of lost interest and was digging another sandcastle, so it went straight over his head. The boy said something along these lines: “Glasnost, glasnost, Russki lavatka frappachoiska blah blah blah.” I pointed to my boy, and said his name, and pointed the child. He looked at me non-plussed. “English,” I said, pointing again. “You are Russian?” “Ah! English!” he beamed. He then launched into another stream of incongruously throaty Russian words, finishing, after a cheeky look directly into my eyes, with a triple pronouncement - a troika if you will - of: “Farking hell, farking hell, farking hell!”. Man, my poker face is good.